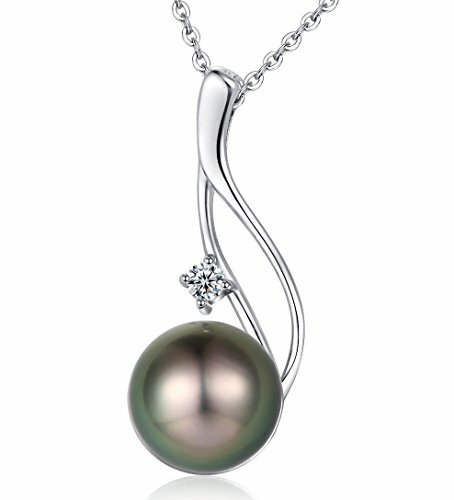 Here's How You Can Surprise Your Special Someone With The Most Incredible Black Pearl Necklace! Looking for a thoughtful, beautiful and eye-catching necklace gift for your wife or girlfriend? Want to show your love and affection with a special gift? Need a unique birthday or holiday gift for your mother, sister or daughter? Introducing The Luxurious & Delicate 9-10mm Round Cultured Black Pearl Pendant Necklace By Chaulri! Now you don't have to settle for cheaply-made and generic necklaces anymore, since our one-of-a-kind Tahitian black pearl gold plated sterling silver pendant necklace is here to impress your loved ones and make you the husband, boyfriend, father or son of the year! Indulge Yourself In The Unparalleled Beauty & Vintage Luxury Of A Genuine Black Pearl! Believed to bring abundance, luck and prosperity, our Tahitian black pearl is hand-picked by professionals in the south Pacific ocean and brought to the United States, where expert jewelers create a pendant necklace worthy of this legendary pearl. Add A Touch Of Exotic Opulence To Your Every Outfit! Our hypnotizing black pearl combined with the attention-grabbing 18k gold plated 925 sterling silver necklace will make your every outfit unique and match every style. And the best part? Because every necklace is hand-finished, your Tahitian black pearl necklace will be unique! How To Make Sure That Your Pearl Stays Beautiful Forever! Pearls may deteriorate when in contact with chemical cleaners, perfumes, cosmetics or hair care products. So make sure that your black pearl is the last thing you put on and the first thing you take off, And always keep your black pearl in the jewelry box! Don't Hesitate! Click "Add To Cart" NOW & Spoil Your Loved Ones Today! ❤ DISCOVER THE LEGENDARY TAHITIAN BLACK PEARL❤ and impress all your friends with our luxurious and beautiful genuine Tahitian black pearl pendant necklace. Believed to bring abundance, luck and prosperity to everyone who wears it, our 9-10mm round cultured Tahitian pearl is hand-picked by GIA-certified specialists for its superb luster, color, surface and shape. ❤ HAVE YOU EVER HAD A ONE-OF-A-KIND NECKLACE?❤ Our elegant black pearl comes from Tahiti but the 18k gold plated 925 sterling silver necklace is hand finished in the US by experts, so you can rest assured that your pearl necklace pendant is unique. No two pieces are exactly the same, which means only you will have that particular necklace in the world. ❤ UNLIKE LOW-QUALITY PEARL NECKLACES❤ that tend to lose their radiance over the years, our premium Tahitian black pearl gold plated necklace will remain radiant for years to come and match your every outfit. The timeless classic design combined with the hypnotizing black (with green, silver, purple, pink, or peacock overtones) color will allow you to dazzle everyone! ❤ LOOKING FOR THE MOST UNIQUE GIFT IDEA FOR YOUR LOVED ONES?❤ Surprise your girlfriend, wife, mother, sister, daughter, niece, aunt or grandmother with our delicate and beautiful round cultured Tahitian black pearl 925 sterling silver pendant. The vintage details and deluxe gift box will make our women's pearl necklace the perfect birthday, Valentine's Day, Mother's Day, anniversary, graduation or holiday gift! ❤ YOUR SATISFACTION IS OUR TOP PRIORITY!❤ That's exactly why we back our genuine Tahitian black pearl necklace with our 30-day full refund guarantee and exclusive LIFETIME warranty. If, at any given time, you are not 100% thrilled with the gorgeous design and mesmerizing black pearl, we promise to go above and beyond in order to ensure your satisfaction. What are you waiting for? If you have any questions about this product by CHAULRI, contact us by completing and submitting the form below. If you are looking for a specif part number, please include it with your message.